Welcome to the Winchester PMC Kids Ride! We are very excited to announce Winchester's 5th Annual PMC Kids Ride to take place on June 15, 2019! We will again be riding at Lynch Elementary School and the adjacent neighborhood. Thank you to the neighbors that continue to welcome and support us as well as the WPD and DPW that keep all the riders safe on the roads! The ride is intended to both raise cancer awareness as well as get Winchester and surrounding communities’ students involved in giving back and being active in the community at an early age. Just like the adult ride, 100% of all rider raised donations will go straight to Dana-Farber Cancer Institute (DFCI) and used to support cancer research, patient care and families of patients currently involved in treatment. Last year, the PMC Kids rides collectively fundraised $950,000 for the DFCI!!!! That is REAL money that will make a REAL impact on the fight against cancer! We are hoping as community that we can build on our previous years' successes and push ourselves to give back even more this year! Make the commitment to join us because you want be a part of giving back and you want to help fight cancer! This ride is dedicated to all of our loved ones whose lives were cut short by cancer and to those who continue to inspire us as they live with or have beaten cancer. 4:30 - 6 pm – If you have registered for the ride, come pick up your PMC goody bag (includes a number, punch card, bracelet, t-shirt, water bottle and a $20 '47 Brand gift card) at 46 Wedgemere Ave, Winchester, MA. 9:15 am – Ride begins! Lynch Thunder Ride: Ride around Lynch parking lot circle once or multiple times. Suggested for riders that can independently ride tricycles or beginning bikers with training wheels. Sachems Ride: Take on our 1/2-mile loop! Riders will start out at the Lynch Elementary School Horn Pond Brook parking lot and then proceed through the 1/2-mile loop on the streets in the adjacent neighborhood. Do the loop one time or challenge yourself to get your cards punched and do it multiple times! See if you can get more punches than your friends! For those riders that can confidently ride independently with training wheels or those on two wheels. '47 supports the 2019 PMC Kids Rides program. Riders who register for the Winchester PMC Kids Ride and pay a $20 registration fee will receive a $20 coupon to the Jersey St. store (19 Jersey St., Boston, MA) in their registration packet. Certain restrictions apply, coupons expire December 31, 2019). Thanks to Carole Kitchen & Bath, we are also rewarding the two schools with the most registered riders! Certificate of hours provided by coordinator on request. 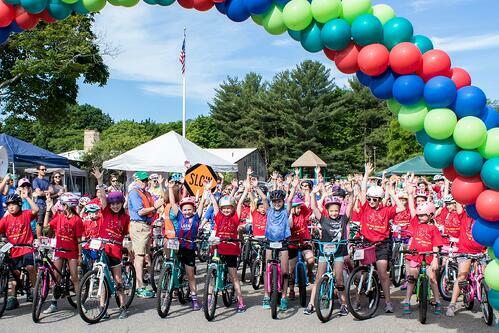 The Winchester PMC Kids Rides relies on local sponsors to help keep costs low and so that the PMC can continue to donate 100 percent of every rider-raised dollar directly to Dana-Farber Cancer Institute. If you or your company are interested in becoming a sponsor or to donate items (pizza, ice cream, snacks, sporting tickets, gift cards, baskets, etc) please click on the button below below.